We are now all back in our respective hometowns and ready to get back to our daily routines. What remains is jetlag, a lot of raw video footage, a plethora of pictures and a raft of great memories. Special thanks to IMG and our guides, Kevin, Phinjo, Sonom and Pasang - our trip was not only well organized, but also safe and entertaining. It is obvious that IMG has cultivated a lot of relationships in Nepal and it showed with our first class treatment and ability to get out of places when others were stranded for days. Also a special thanks to my partners, Mike and Jimmy. It wouldn't have been as fun with you guys not sharing those moments with me. Also to Adam, who had to cancel last minute, here's hoping you can join us on our next trip - Ecuador maybe??? (I hope my family doesn't see this post!). From the moment we stepped off the airplane in Kathmandu, the natural and cultural beauty of Nepal and its people was evident. The scenery was always interesting and varied (unlike many of the mountain locales we have visited), and the spiritual nature of the Nepali people made the trip feel more exotic than most. Our trek up the Hinku valley was just as impressive as our time on the snow, which made waking up every day a new adventure - most mountain approaches are boring slogs up scree slopes. This trip, every time we would look up, we would see something new and amazing. Finally, the scale of the mountains was something none of us has ever witnessed before - all the surrounding mountains were larger than just about any single mountain we had ever seen. Seeing 4 of the tallest 5 mountains in the world so close, above the clouds at a height of 21,000 feet plus, sure made me feel humble and grateful to be in that spot in time. 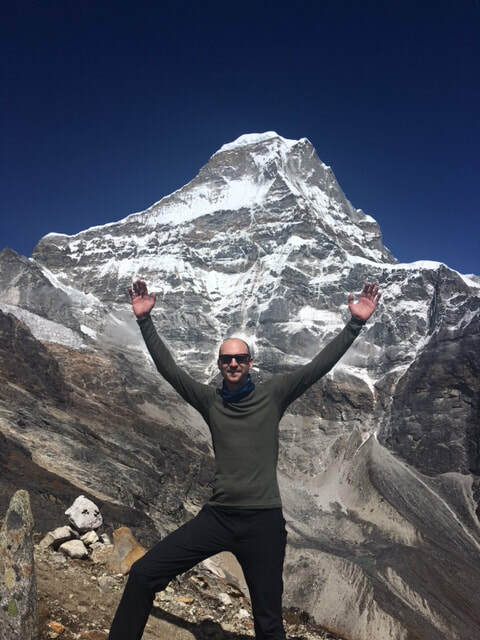 Below are a couple of pieces of raw video footage taken along the trip - from a couple of interesting helicopter rides to a view from the summit (with a quick glimpse of Mount Everest), I think you will see why this was such a special trip. We are back in Kathmandu after a flurry of helicopter rides. We descended to Khote (11,500 feet)! early in the morning on the 24th,, and after a long drive competition off the helipad with a dozen or so villagers watching intently, we flew to Lukla. What an amazing chopper ride through the Hinku Vslley! We were then stuck in Lukla, as the weather hadnt allowed any planes in or out for the past 2.5 days. We snagged the final two rooms at the Paradise Lodge (we slept 4 to a room). After our dinner, we got into a singing contest with a large group of very inebriated Brits - we were beaten soundly, but were in much better shape than them in the morning. After being without internet for over 36 hours, we are happy to report a successful climb! We hiked from Khare to the glacier and over to Mera La (17,600 feet) on crampons. Our camp was in a sheltered depression, so we were spared the wind that was being forecast for the evening. After an early dinner we were sent to bed and told to be ready for a 1:00 am wake up call. After a quick breakfast, we were on our way in the dark, around 2:30 am. We proceeded up the moderate snow slope very slowly, and by 5:15 am, the sun began to creep up over the horizon. The forecasted 40 km winds never appeared, and we were soon left overheated in all of our clothing. By the time we had shed our clothing around 8:00 am, our packs weighed upwards of 25lbs! We kept climbing until about 9:30 am, when David and Mike decided they couldn’t get further (around 19,800 feet). After some consultation, it was decided that we would all drop our packs and go for the summit less weighted. This seemed to work, as the whole group (minus Rick, who stayed back at Mera La) made it to 20,700 feet, before Mike and Jimmy decided to turn back. They both had made personal elevation records and should be proud of their achievement. 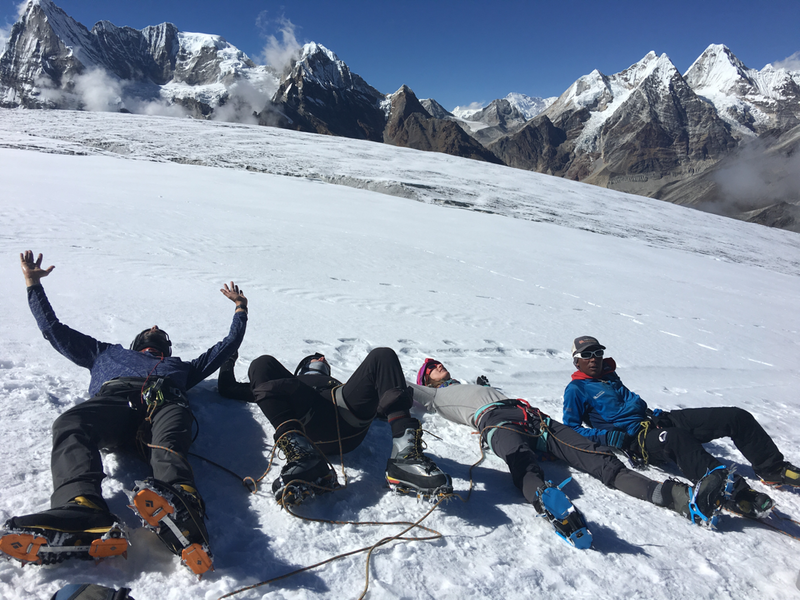 The remaining four climbers made their way to the base of the summit - a steep slope with a crevasse at the bottom. 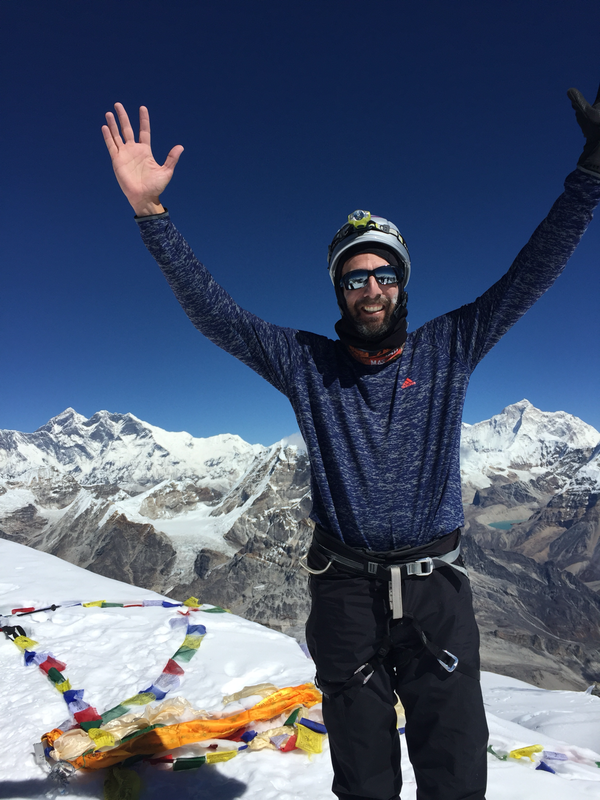 An hour later, David, Dylan, Ashley and Robert were standing on the steep summit of Mera Peak, 21,500 feet, nine hours after departing Mera La. A gruelling 4.5 hour walk down the snow slope brought us back to Mera La at 3:00 pm, almost 13 hours after we departed. We could barely walk and went straight to bed for the next 16 hours! Today we walked all the way down to Thagnak (13,800 feet)- tomorrow we will walk down to Khote (11,500 feet) before catching a helicopter to Lukla and then on to Kathmandu. We will keep you updated with the rest of our flight arrangements. Thanks for tuning in to our blog - we will continue to post on the end of our trip and thoughts, as well as getting some pictures onto the website as well! Today was skills day, where we learned basic glacier skills - walking in a rope team, ice axe use, how to ascend a steep slope on a fixed rope, and belaying. Only a few of us have been on a glacier before, so we spent a couple of hours honing these skills before retiring to the dining room for a cappuccino and lunch. The afternoon was spent with crampon instruction and a briefing of our summit day. We are off for the glacier tomorrow and our last camp, Mera La, at approximately 17,100 feet. We hope to get to Mera La by lunchtime, eat an early dinner, get some rest, and be up around midnight for our summit push. 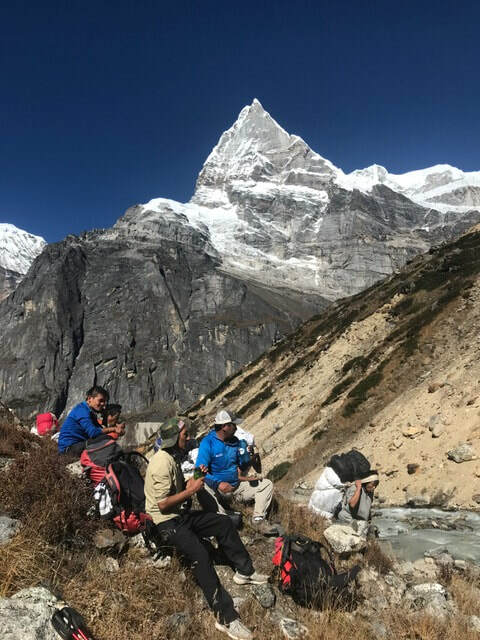 We are preparing for a gruelling day of around 10 hours round trip - we hope to summit (21,400 feet) around sunrise (around 7:00 pm central time), where we hope to see Mount Everest and 4 other 8,000 metre peaks “close up”. The weather forecast for our summit day is still a bit unsettled - 40 km winds and clear. The wind is at the outer acceptable level, so we are hoping for it to dissipate by tomorrow night. We won’t be in contact until well after our summit, so this will be the last post for a couple of days. Here’s hoping for safety and success for our group! ​Today was a long day - we hiked up to Khare (16,100 feet) in the morning, taking just under three hours for the 2,300 feet of gain. The most amazing thing, though, are the views from the room - the summit of Mera Peak is front and centre, giving us plenty of motivation. The afternoon was spent climbing higher; we made it to 17.100 feet before descending back to Khare. We are starting to feel the effects of the altitude, but everyone feels good and still has their appetites. Happy hour was spent playing cards and watching Nepali martial arts movies with the local sherpas. Unfortunately, the manager of the restaurant didn’t like Nepali wrestling, or we would have seen some lucha libre, Nepali style. Tomorrow is a rest day and skills day, where we will get to know the equipment we will be using on the glacier starting Saturday. ​Mike is getting really high and The PGA hits Thagnak! Our last day in Thagnak has been the best day of our trip (so far). We woke to beautiful clear skies (although the sun doesn’t hit the valley and warm it until around 9:00 am), did some laundry in the nearby stream, and headed out on a long, steep acclima-colada hike. 3 hours later, we were at 16,400 feet, a new record for Mike, and exactly the same elevation as tomorrow’s destination, Khare. We are all feeling very strong, which is very encouraging. The weather was spectacular, as was the scenery -the surrounding mountains towered over us (most are 21,000 feet plus), and we were lucky enough to see some avalanches come off some of the rock faces. After a 1.5 hour descent and another lunch of noodles, I pulled out my secret weapon - a Callaway 5 iron, which has been hiding in my climbing duffle since we left. I am proud to be the title sponsor of the Inaugural Thagnak Open golf tournament. We had six contestants play on a 7 hole golf course winding through the hamlet of Thagnak and the river that bisects it. The proprietor of our lodge saw what we were doing and fashioned a cup out of a plastic water bottle and we were off! After about 5 minutes we had a gallery of about 10-15 watching us play, dodging the river and piles of yak dung. After all was said and done, Jimmy Collier, the Texas Tornado, was victorious, and hoisted the Thagnak Cup. A great time was had by all. Tomorrow we head to Khare, where we will spend two days preparing for our time on the glacier - the final countdown. Today was essentially a rest day - we walked up to about 14,500 feet, where we got a great view of a glacial lake and surrounding mountains. Definitely the best views of the trip so far. The weather clouded over around 1:00 pm, so we tried to keep warm in our sleeping bags or in the dining room after lunch. 4:30 pm is happy hour, which consists of us drinking various types of tea and playing cards. We have coerced Dylan to join our card games so we now have a Canada vs. USA spade tournament. So far the USA is a perfect 3-0. Speaking of weather, our eyes are now set on the summit forecast for the next week - as we get closer to the top this is becoming a concern. Right now we are set to summit on the 22nd - the weather looks very good up until the 21st, when the winds are supposed to pick up significantly for several days afterwards. We will continue to monitor the forecast in the hopes that the weather will change for the better (our last two climbs were also effected by weather). ​Greetings from Thagnak, at 14,200 feet! We covered the 2,700 vertical feet in just under 4 hours, making great time. 3 hours into the hike we visited a monastery, built into a cave. The resident monk seated us at a small table, where we were given a history lesson about the area and the monastery- what a great experience! Our tea house is cozy, but nice, and the food appears to be better than our previous lodging - I had a yak steak with fries. Speaking of yaks, we saw our first yaks and naks today. Apparently, naks are female yaks, so when I wrote about a yak milk latte a couple of days ago, the picture might not have been so appetizing! Rick had a bad day and is not feeling well - we will see what his future holds. The rest of us our doing well - the key now is to drink lots of water and keep eating, which are both not easy tasks at altitude. The team ... at 13,500 feet. ​After a great nights sleep (it was right around freezing), we awoke to a beautiful clear morning. The morning was not so beautiful for one of our team members, Jordan, who suffered a rib injury. It got worse during our hike yesterday, and he was helicoptered our this morning. That leaves 7 of us - Robert, who has summitted Everest and is an accomplished climber, Dylan and Ashleigh, a married couple who are geologists, Richard, a lawyer from Washington DC, and us three flatlanders. After Jordan’s departure, we hiked up the valley until we hit an altitude of 13,500 feet - the day was absolutely perfect, and we got a clear look at the big mountains. The trails are relatively empty - we are sharing the tea house with Russians, Dutch and American climbers. It looks like we have a strong team - everyone is doing well. Tomorrow we are off to Thagnak, at 14,200 feet. We will be staying there for three nights, and taking some great acclimatization walks. ​We were up at 6:00 am to the sound of helicopters overhead - still no airplanes landing in Lukla, but the weather appeared to be clearing, so we were encouraged. By 8:30 am, the first of our group had boarded the chopper and headed out for Khote at the bottom of the Hinku Valley (elevation 11,500 feet). The weather was still unstable - low fog and lots of cloud, but over the next hour our entire group and accompanying baggage arrived safely. Khote is a beautiful little village with around a dozen or so structures, the largest of which is the Lama Lodge, our home for the next two nights. It’s basic (just an uninsulated cabin with four bedrooms), but it will work just fine. 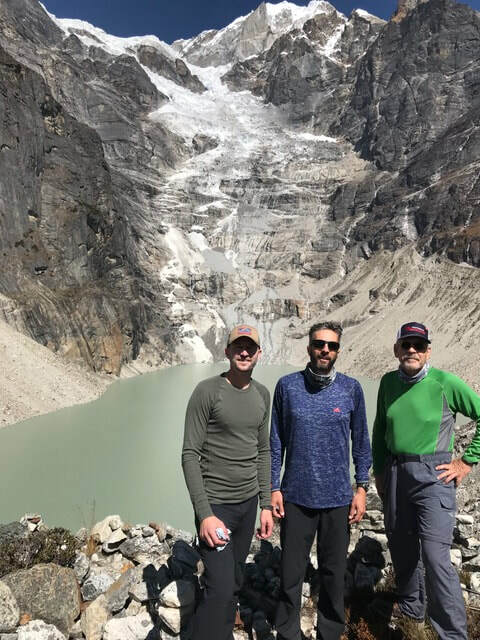 After lunch we went for an acclimatization walk to 12,600 feet - Jimmy had a hard time pronouncing acclimatization, so we now refer to them as Pina Colada walks. Mountain humour just doesn’t translate very well. Tomorrow we will hike up to Thagnak, which is 13,500 feet, and then return to Khote. The weather is supposed to clear up, so we are hoping for blue skies and warm temperatures. Ordinary guys, boldly going where others have gone before.